The two boys did everything together: family activities, church activities, school, and sports. Despite Justin’s return to his usual positive outlook, Patrick was still struggling. He was angry and bitter toward God. “For two years, I fought a battle that Justin wasn’t fighting. I was praying for what he wasn’t praying for. I wanted a miracle. But sometimes the miracle isn’t divine intervention and healing, but the ability to face the unknown future with grace and dignity. Justin didn’t need a healing. He needed me to be his hands and feet. 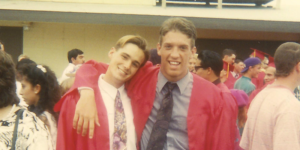 Now I see the privilege and honor it is to do this for my friend,” Patrick said. Patrick says this revelation transformed and cemented their bond in friendship, bringing with it new possibilities in life. Remarkably, when Patrick explained the situation to his boss, he was given the six weeks off with only one stipulation: to do everything in his power to document the journey. Patrick told Justin the good news and then in 2013, Justin and his family moved within a few blocks of Patrick’s family. 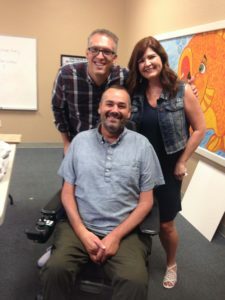 While Patrick physically trained six days a week, Justin created a website to help raise money for the supplies such as a film crew, backpacks, and an off-road wheelchair. With only a few short weeks before the trip, they began to train with Justin’s new wheelchair. 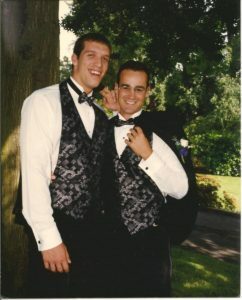 Another friend, a firefighter and EMT named Ted Hardy, agreed to train and go to Spain for the first ten days. Day one of the journey started with the daunting task of climbing the Pyrenees Mountains. After a while, the road became too rocky for the wheelchair. Placing Justin in a sling, Ted and Patrick carried him 10 to 15 feet at a time before needing to rest. At one point, they set him down while going to scout the trail ahead. As Justin laid with his eyes closed, he heard footsteps approaching. “I open my eyes and I see a man standing over me, slapping me in the face!” Justin said as the room erupted in laughter. “Boy, he was so excited to see me. But he proceeds to tell me I must be a little crazy to do something like this,” he says with a mischievous grin. Ted and Patrick return and they learn a little more about the man. Although the encounter was only four minutes, his impact has forever changed their lives and served as a mantra for the remainder of the journey. After a few minutes of conversation, the gentleman went on his way up the hill, then turned around briefly. Other pilgrims came along the way, sharing their stories and lending a helping hand all the while, transforming each other’s lives. Patrick and Justin with SoCal Editor, Beckie Lindsey. 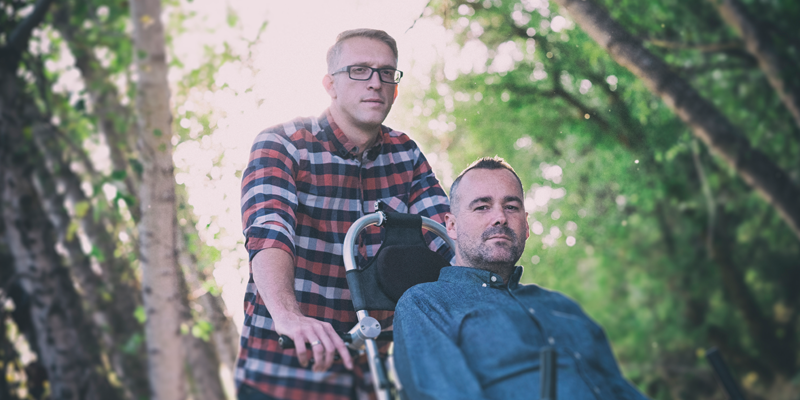 As Justin and Patrick continued to share about their journey, the story evolved into something familiar and yet at the same time extraordinary. Like the protagonists in J. R. R. Tolkien’s The Lord of the Rings Trilogy, the men were thrust into an impossible situation to accomplish a seemingly impossible goal. But along the way, fate (faith) steps in by sending many others to help share the burden which forever changes all involved. Justin and Patrick, like Frodo and Sam, accomplish their goal together. 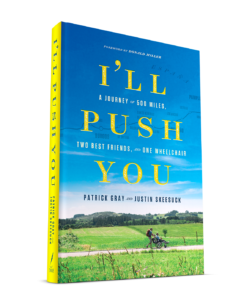 Since the trip, the two have written a book and made a documentary about their journey, both titled I’ll Push You. The documentary will be out in theatres in November. 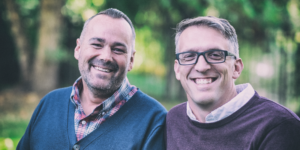 They have founded Push, Inc. and are speakers for conferences and events, equipping audiences and organizations with the skills needed to do more together through the power of community.